Be the first to share your favorite memory, photo or story of Valeriy. This memorial page is dedicated for family, friends and future generations to celebrate the life of their loved one. 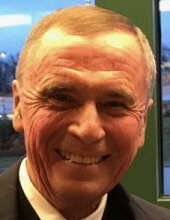 VALERIY MOYSAENKO, DR. age 73, passed away Sunday, January 13, 2019 at his home in Albany, OH. Loving husband of Louise (nee Michaelis); dearest father of Tanya Wagner (Jon), Eric, Adam (Barbara) and Laura Gettinger (Jared); beloved grandfather of Grace, Aiden, Dylan and Eloise; loving son of John (deceased) and Marta (nee Michaelof); dearest brother of Dr. Leo (Andra) and Dr. Gleb (deceased) (Luba). He served in the U.S. Air Force and was a General surgeon in Troy, OH for many years. After retiring from private practice, he was a surveyor for the American College of Surgeons Commission on Cancer, helping to develop more robust, effective cancer programs at facilities across the country. Friends may call at THE KOLODIY-LAZUTA FUNERAL HOME, 5677 STATE RD., PARMA, FRIDAY, JANUARY 25 FROM 4-7 P.M. PARASTAS 6 P.M. Funeral Service Saturday, January 26 at St. Vladimir Ukrainian Orthodox Cathedral at 9:30 a.m. (PLEASE MEET AT CATHEDRAL). Interment Brooklyn Heights Cemetery. Luncheon for family and friends to follow. In lieu of flowers the family suggests contributions in Valeriy’s name to St. Vladimir Cathedral, Parma, OH. To send flowers or a remembrance gift to the family of Valeriy Moysaenko, please visit our Tribute Store. "Email Address" would like to share the life celebration of Valeriy Moysaenko. Click on the "link" to go to share a favorite memory or leave a condolence message for the family.